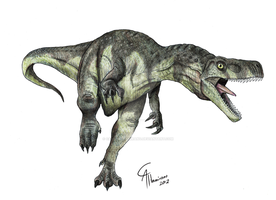 Another raptorine dinosaur for the book. 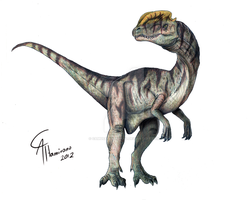 Apparently eoraptor was one of the earliest dinosaurs. D'awwww. That's awesome, beautiful, and cute all at the same time. Den här var den bästa hittills av dinosaurierna. Gott nytt år förresten! I love the coloring style! Looks great, I love all the little details and highlights. think ur smart huh? Its ugly! U-G-L-Y I tell ya! Du kan gott stanna kvar i Australien. Your dinosaurs are amazing. I just am in love with the atmospheric lighting fade you did on this. Dude I'm a big fan of Dinotopia. 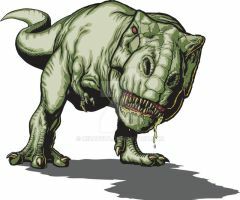 I've loved dinosaur art since I was young ..... and this is AWSEOME!!! Awesome texture on the skin, the blue lighting really helps accentuate the form (and coolness) of the character.